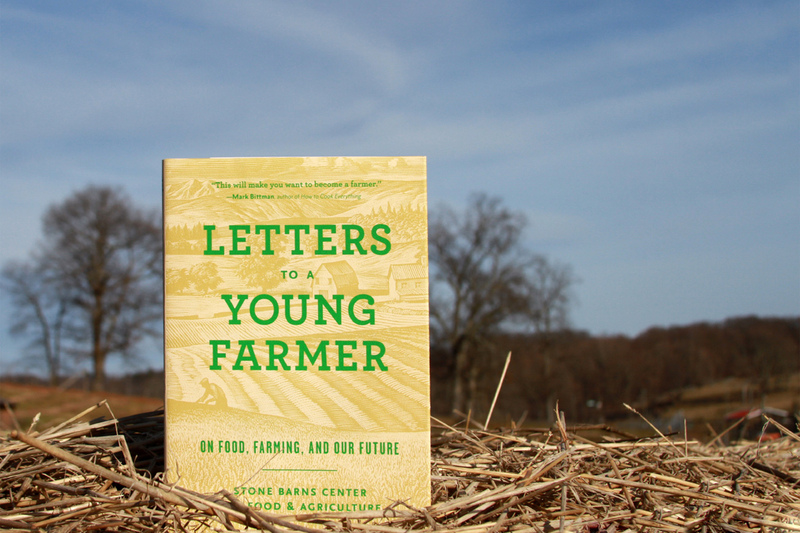 In 'Letters to a Young Farmer,' Joel Salatin, Temple Grandin, Karen Washington, and many others share their wisdom, advice, hopes, and concerns for young farmers. It’s a tough time to be a farmer. Consider the high cost of buying farmland, the systemic economic and ecological problems resulting from decades of industrial agriculture, and the uncertainty and disaster approaching due to our changing climate. But really, it’s always been tough to be a farmer. They face long days of hard labor, minimal profit, unreliable and ever-changing markets, and a general lack of understanding and respect for their work from the very people they feed. It’s no wonder that young people aren’t racing to take up the charge. The average U.S. farmer was 58 years old in the last agricultural census, and that age continues to rise. Thankfully, the siren song of agriculture continues to call to young people and draw them to farm in cities, suburbs, and rural regions across the country. It is to these young farmers, and to the many who want to farm but haven’t yet taken the leap, that Letters to a Young Farmer speaks. The answers range from personal stories to practical advice, including wise reflections on how to grow healthy food in ways that treat land, animals, and people with respect. Civil Eats spoke with some of the book’s contributors in hopes of furthering the conversation. We asked them to elaborate on the advice they passed along in their letters and to reflect on both the challenges and opportunities young people entering agriculture encounter. In addition to sharing deep concerns, they spoke about their hopes for the future. Joel Salatin co-owns Polyface Farm with his family in Swoope, Virginia. He is the author of 10 books and a frequent conference speaker, and advocates aggressively for food-choice freedom and local food systems. What do you see as the challenges most important for the new generation of farmers to overcome? The number one challenge is their own sense of entitlement. Just because you love earthworms and want to produce good food does not mean the world owes you a living. You have to make it work. You have to do whatever it takes—live in a yurt, have a johnny house, live in a cave, get up at four o’clock, forget the coffee, live with secondhand clothes. You’ve got to do what it takes to make it happen. Looking out at the rising generation of farmers, what are you most encouraged by? I’m most encouraged by their ecological understanding. We know so much more now about everything from the soil to the human microbiome. These are dots that are being connected that are just fantastic. For the first time in a long time, we truly do add gravitas to the fact that we can’t just be eating Hot Pockets and Velveeta cheese all the time, and that bodes well for consumers, for people of all stripes, to invest in land care. And nobody takes care of land like ecologically minded high-integrity farmers. One of the major themes in your letter is the idea of pursuing diversity and complex relationships. Why is that important? One of the reasons farms have gone to mono-speciation and segmentation and segregation is forced simplicity. But as we know, ecology is not simplistic; it’s complex. You can either have simplicity and externalized cost, which are simple in the short term, or you can have complexity and not have externalized costs, which takes a long-term view. I don’t want to make it sound like if you go to diversity, it’s going to be simpler or better, but in the holistic scheme of things, it is simpler and better. You don’t have to have a refrigerator full of pharmaceuticals; you don’t have to take the pesticide exam and be certified as chemical applicators; you don’t have to have a door on the farm with padlocks on it so nobody will get in there and eat something. When you embrace ecological and financial diversity on your farm, in my view, you’re embracing actually a simpler life than trying to fight against nature every day by being simplistic. What do young farmers need to hear but aren’t hearing on a regular basis? Probably the element of time. We live in an instant gratification time—far worse than historically. I run into aspiring young farmers who say, “I gave it a go for six months, and it didn’t work” or “I gave it a go for one year and it didn’t work.” You’ve got to give it a go for 10 years. And you can’t Google experience. Everyone like me, all the people in this wonderful book, we all desperately want to inspire and encourage young people, but looking at all of our stories, there’s a time element in there, and it’s a long time. For us [at Polyface Farm], it took about five years until we looked at each other and said, “You know what? We’re going to make a living here.” That’s a long time to actually wonder if it’s going to work. This time element, especially for Millennials, is extremely important, because everything is “I want it now.” Everything is instant. Let’s say every new farmer takes the advice in your letter. How would farming be different than it is now? We wouldn’t have a single concentrated feeding operation. I think that would be really good. Secondly, we would have revitalized small communities, small economic communities, and we would see an absolute revival of small business and personal responsibility among consumers, as all these farmers assaulted them with the responsibility to join us as essentially extensions of our hands and feet in the landscape. They might not actually be planting the carrot, but they decide what kind of carrot is going to be planted and how it’s going to be cared for by what kind of carrots they buy. It would be completely transformative. Karen Washington is an activist and farmer. She is co-owner of Rise & Root Farm in Orange County, New York, and cofounder of Black Urban Growers (BUGS) in the Bronx. You’ve spoken to us before about how encouraged you are by young peoples’ attitudes toward healthy food and farming. What most encourages you about young farmers today? I’m trying to encourage as many people of color as possible to go into farming because that’s not the case now. In 2012, New York State was home to more than 35,000 white farmers and 70 Black farmers. From a farming perspective, it’s challenging. But when you talk about food in general, especially among low-income neighborhoods and residents, I see a positive change—people are starting to be more aware. People are starting to fight for and see change in terms of community gardens popping up and urban farms and farmers’ markets that are in the hands of neighborhoods and people of color. Your letter draws a strong connection between farming and work for social justice–arduous, not particularly glamorous, long-lasting, and vitally important. I wanted to open my heart in the letter, specifically speaking to farmers of color. For so long, the message has been around slavery. Even in the ag world, the father of modern farming, George Washington Carver, is never mentioned, although people talk about the Michael Pollans, the Mark Bittmans. I want to remind people of color, especially Black people, that growing food is in our DNA. And slavery is part of our history, but it doesn’t define who we are as a people. We have the same right to feel that we can grow food as anyone else. Listen to what your ancestors have done in terms of growing food. You stand on the shoulders of greatness; you stand on the shoulders of people who knew how to farm from infancy. Though you may hear negative stories, follow your heart, and follow in the steps of people who came before you, because farming and growing food is so powerful. Never give up that dream. Wes Jackson is President Emeritus of The Land Institute in Salina Kansas and the author of many books, including New Roots for Agriculture, Nature as Measure, and Consulting the Genius of the Place: An Ecological Approach to a New Agriculture. He was a Pew Conservation Scholar in 1990, a MacArthur Fellow in 1992, and received the Right Livelihood Award in 2000. What do you see as the most important challenges for the new generation of farmers to overcome? Most young famers are going to have to be stuck with a small [farm]. They’re not going to be sitting on 3,000 acres of corn and soybeans. For most of them, that small acreage will be devoted primarily to the vegetables and the fruits. The challenge is to make a living in a world where the industrialization of agriculture makes it very hard for farmers growing vegetables and the fruits—and [trying] to keep the prices low—to compete. The land is too expensive, and the equipment is too expensive, and given the fluctuation in the markets, that’s a high-risk adventure. Mostly, those ideas [of small-scale farms] are alive on the east coast, the west coast, and major cities in between—not out in the landscape where there aren’t many people. We have an awful time keeping our little market going here in Salina, Kansas. We started that way back in the early ’80s, and they’re constantly struggling. It’s in a large sense subsidized by people that want to keep the idea of healthy food going. What words of wisdom would you give a young farmer looking to pursue ecological agriculture amidst these challenges? He or she better know where their market is, or they’re going to be hauling [their food]—as some of the people here in Kansas do—to the famers’ market every weekend, from 50 miles away. That means gasoline, that means time. Or, they could be in some nice place—like Amherst, Massachusetts, let’s say. And there you have this progressive community, and you’ve got smart students, smart professor types, and they’ll buy the product from these little farmers. But those [successful small-scale farmers] are anomalies. And they didn’t come out here [to Salina] to do it, and I don’t blame them. They need to know where they are, what’s the market. And they’ve got to have some specialty niche. This is not to discourage them, but they need to have their eyes open and be watchful of potential. In your letter, you explain the history and tradition of the Green Revolution to young farmers. Why do you believe that’s vital for someone starting out to know? In the so-called third world, where the Green Revolution had great increases in fertilizer, pesticides, irrigation wells, there were social consequences that were pretty severe. We took it to India, and at the time, India wasn’t burning much in the way of fossil fuel—and India was being fed, by the way … We introduced the industrial model into all of those systems, and that industrial model has further implications back here at home. This is the context in which the young farmer finds him or herself. Nancy Vail and Jered Lawson are cofounders and codirectors of Pie Ranch, a food and farming education center on the San Mateo coast in California that cultivates a healthy and just food system from seed to table through food education, farmer training, and regional partnerships. Nancy and Jered live on the farm with their two children, Lucas and Rosa. What about the new generation of young farmers encourages you most? Embarking on the path of farming is an act of hope in a time when there’s so much that we could despair about. It’s not an easy choice, and so to make that choice means that people are thinking beyond themselves and thinking about the earth and the communities they’ll impact. What would you say to young people who want to start farming? Regardless of income level or privilege of any sort, there are ways to engage, whether it’s in a community garden or growing herbs on your porch—just jump in wherever it makes sense. That will hopefully lead you into the next step on the path. What do you say to encourage young people to get into farming? Read as many books on the subject that you can get ahold of, and check out a lot of different farms. If you have the ability to apprentice, do that for as long as you can financially to get as much experience as possible in a wide range of production systems. Go to as many conferences as you can—the Black farming conference, the Latino farming conference, Eco-Farm, the Young Farmers conference—and meet folks who are just starting to get into farming to share and hear stories. What do you wish you had known when you were a young farmer? I got a lot of really good advice; the biggest thing is to really follow your heart and to believe in your convictions and you’re drawn to do in the world. Even when it gets hard, keep believing in yourself—if you don’t have that, then you’re missing most of what you need. At the same time, stay aware of what is happening in the world. Stretch out of your comfort zone and listen to other communities to hear what they need. That will also inform the direction you end up going in with farming. Nephi Craig, a White Mountain Apache/Navajo executive chef, is the founder of the Native American Culinary Association, a network of Native cooks, chefs, scholars, farmers, and community members devoted to the development and preservation of Native American foodways. He is currently the Nutritional Recovery Program Coordinator at the Rainbow Treatment Center and Executive Chef of Café Gozhóó on the White Mountain Apache Tribe in Whiteriver, Arizona. What challenges do you see in moving sustainable, local food forward? I’m seeing changes across Arizona where we’re really starting to tap into the ancestral methods of growing, and we’re starting to study the wild flora and fauna of the state. It may not look like the desert has a lot to offer, but this revitalization of Arizona food and agriculture has been based on Native technologies—dry planting, wild herbs and medicines—that have been developed by Native peoples and reused. One of the challenges that we continue to encounter is getting the tribal people of Native cultures to be recognized and acknowledged in the process of “rediscovering” stuff. There is a lot of “Columbusing” going on. There’s a duty of people revitalizing these technologies to be responsible about how they’re doing it. [Native people] are sacred; they’ve survived this attempted genocide and they should be treated respectfully. Quinoa, chocolate—entire economies are built on products that were taken out of Native hands and are being sold while Native people are still in poverty. Even with this new sense of openness, there are still obstacles. In my generation, as a Native person and a person of color, it’s safe for me to speak as an advocate for social justice and public health issues relative to our government. I never could’ve done that before. If I was to speak strongly against these systems, it could’ve been dangerous, even life-threatening, for me 50 to 100 years ago. What role do chefs play in encouraging these changes? Having a creative position of advocacy comes with a sense of responsibility and sensitivity. I’m sure it’s like that in every region, but it’s a little more amplified for Native cooks and chefs that have a certain degree of presence in the professional world. We’re moving forward sensitively to unravel that knot and to provide food that’s simple and accessible and cool and fun. I’ll teach a classic dish of potato gnocchi—it’s an Italian dish, but impossible without potatoes from the Americas. Ratatouille is 75 percent Native foods. And an Asian hot pot—it would never been as hot before 1500 without Native chilies. We’ve accepted the master narrative, but going back to our generation, we’re taking it back. What do you say to encourage young people to farm? Be prepared for a lifetime of hard work, commitment, science, and education. To me, cooking and agriculture go hand in hand. They require someone to be very strong, sensitive, and emotionally intelligent. You must to be able to pinpoint all the dynamics happening while growing and harvesting and feeding people. Temple Grandin is a professor of animal science at Colorado State University. Some of her books are Animals in Translation, Thinking in Pictures, and Improving Animal Welfare: A Practical Approach. As a society, how can we get more young people to pursue careers in agriculture? I have found that exposure to career choices at a young age is very important. One of the big problems we’ve got in education today is they’ve taken out the hands-on things, and students don’t get exposed to enough interesting things they could turn into careers. We need to be working on reading and the mathematics—and cooking, sewing, woodworking, and growing things. I’m a big proponent of [Future Farmers of America] programs. If a kid raises an animal, he has the responsibility of taking care of it. If we don’t expose students to agriculture, they’re not going to get interested. It’s that simple. What would you like to see the younger generation pick up and focus on in order to forward your goals? Well, I think it’s good that people are getting into handling animals in a low-stress manner—that’s really good. Pay needs to be increased for stockmanship jobs. Research is very clear: good stockmanship pays. Calm animals gain more weight; dairy cows that are handled gently give you more milk. You take a skilled pen-rider in a feed yard—he finds those sick cattle when they’re just thinking about getting sick. People always want the thing, the new piece of equipment, more than they want the management. Stockmanship does not get enough credit. Some of the people who are the best stock people are the kids who are kind of quirky and different, that have a special-education label. They’re going to be great at taking care of the dairy cows. What advice do you have for young people interested in pursuing a career in agriculture? Try on, each summer, a different internship when you’re in college. Try on different jobs in ag, see what you like. Try ’em on, just like you try clothes on. When I went to my aunt’s ranch, I tried on beef cattle, and I found out I liked them. We’ve got to get some of these kids off the electronics and show them there’s a big world out there. Ben Burkett is a fourth-generation African-American family farmer from Petal, Mississippi. He currently serves as president of the National Family Farm Coalition and is an active member of the Federation of Southern Cooperatives / Land Assistance Fund and the Indian Springs Farmers Cooperative Association. How big is the need for young farmers in Mississippi? In our co-op, we’ve got 33 members, and the youngest one is 48. And the next youngest one is 60. I’m 65. And the best farmers are in their 70s. The problem with all these old farmers is we’ve got a market for a whole lot of stuff, but they say, “I’m not going to grow more; I’m going to grow less, if anything.” Our co-op has been around 40 years, and we’ve got to do something to keep going. We have no other choice, unless we want to see everything go out of business. Are there young people in your area who want to take over? Over the years, we’ve had two or three start a farm. They try a year or two and go broke, then come back and try again. The ones that I speak with, they really want to do it—they want to be farmers—and that’s 90 percent of it. You’ve got to have the desire. I get calls all the time, from New York or Chicago. They want to come to the farm for two or three months. Their idea is that farming is glamorous, but when they get to the nuts and bolts of it, reality hits. [We work from] five o’clock in the morning until dark. There ain’t never been a farmer who says ‘I’m caught up.’ Ain’t no such thing, whether you’re farming 10 acres or 10,000. But I think it’s a bright future; it’s going to have to be. What are the biggest challenges the new generation of farmers has to overcome? Access to money, capital—to buy land and equipment—especially in the Black farming community. Land is so expensive now. In my era, farmland was $5,000 an acre. What are you encouraged by? The consumer is driving [the market]. They want to know where their food comes from, the quality of it, whether it’s grown organic or sustainable. Any time they talk like that in Mississippi, you know the other 49 states already know what’s going on. How would you change farming in the U.S., and what advice would you give young farmers to help make that happen? Less corporate control. You’ve just got a few farms controlling everything—tomatoes, celery, watermelon—it’s just a few farms. I would like to see local control, where farmers in specific areas farm together, produce their own energy together, and produce their own everything within their own watershed. Not only the food they eat but the energy they burn. I believe, in the end, it’s going to come back to that, because you can’t keep on this fossil fuel deal. People want to know that their food comes locally. Joan Dye Gussow is the Mary Swartz Rose Professor Emerita and former chair of the Nutrition Education Program at Columbia University Teachers College. She is the author, coauthor, or editor of five books, including The Feeding Web: Issues in Nutritional Ecology, This Organic Life, and Growing, Older: A Chronicle of Death, Life, and Vegetables. She lives, writes, and grows organic vegetables on the west bank of the Hudson River. You’ve taught a class about nutrition and ecology to a generation of students—what encourages you about young peoples’ attitudes toward food and farming today? When I first started teaching this course, I often had students who knew nothing about ag, even if they’d grown up around people who farmed every day. But there was no association between nutrition and ag; I was thought of as crazy for asking people to learn about ag from a nutrition standpoint. On the whole, nutrition students don’t have very much knowledge or education about agriculture; it’s simply not taught on that level. But the course is very popular, and people are very grateful. In your letter you reflect on the fact that you’ve been growing food seriously for 30 years. What do you wish you had known when you were starting out? The real issue is to feed the critters in the soil. I only understood that two years ago. You keep digging, and you think you’re adding stuff to the soil and you’re helping it, but it turns out the soil is doing a good bit of the work itself. I wish I had known I should do minimal tillage—without herbicides—to recognize the degree to which the little buggers in the soil are doing it all. Your letter also details the decline of farmers in the U.S. How would you encourage young people to take up farming as a way of life? In this era of total mediation of everything—the degree to which people are hooked to the web and their phones and mediated information, to be that much in touch with the natural world is very therapeutic. The most rewarding thing you can do is watch nature do its business. You think of farmers as being isolated out there on the prairie, but that just doesn’t exist anymore; everyone has immediate contact with the entire world. You can live in a wonderful, free way, with a connection to nature, and it gives you a wonderful perspective on the world. It’s an unparalleled kind of life. It’s very hard work, and people can’t assume they’ll get rich, but I also think it’s a great life.